Did the FBI alter the voice of Pedro Albizu Campos? From 1947 onward, the FBI filmed and photographed every event where he appeared. Tape recorded every word he uttered in public. They also photographed people in the audience and arrested many of them…based on those photos alone. This happened everywhere that Don Pedro went. The FBI committed 40 (FORTY!) agents to Pedro Albizu Campos, to follow him everywhere he went all over the island. This allowed for a constant rotation of ten FBI agents. 24 hours a day, seven days a week he was surrounded by ten FBI agents who watched his every move, and recorded every word he spoke. In effect, the FBI became the biographer of Pedro Albizu Campos. Don Pedro’s FBI file (his carpeta) contains close to 20,000 pages. One page shows a complete record of the 33 speeches he gave from the day he returned from prison, till the week before they imprisoned him again. At every one of those 33 speeches, an FBI agent named Jack West took newsreel footage of Don Pedro, while other agents worked the tape recorder and took photographs. 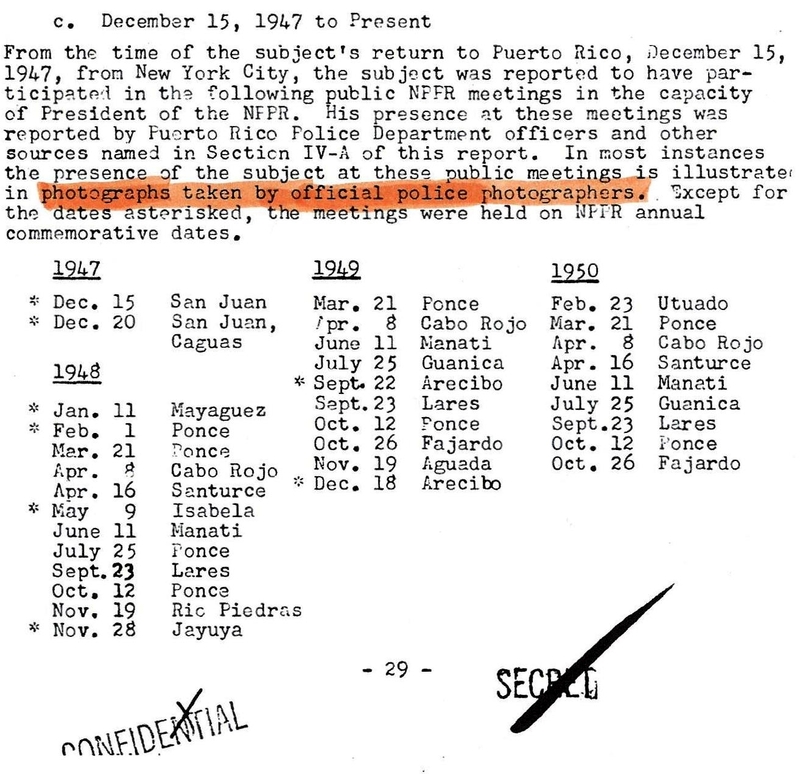 In addition, the FBI agents visited all the radio stations and demanded the original tapes of any speech that Don Pedro broadcast over the radio. If the station manager did not turn over these tapes, he was threatened with losing his FCC broadcast license. The result of all this, is that the FBI had dominion and control over almost all of the biographical material regarding Don Pedro. The only thing they couldn’t control (though they certainly tried) was the memory, and the love, that people had for him. But memory is a very fickle thing. Now, fifty years after his death, the most direct memories we have of Don Pedro are the photographs of him, and the recordings of some of his speeches. It is my belief, that THE FBI TRIED TO CONTROL OUR MEMORY OF ALBIZU’S VOICE. Here is why I believe that. Don Pedro was a world-class orator. His words had the force of powerful music. He found a cadence. His language was direct, yet lyrical. He aspired to touch the soul and he did. His message, his words, his voice, all had a tremendous authority. That is why they called him El Maestro. I have listened to the speeches of Albizu…the ones that are publicly available. In almost every speech, his speech rhythm sounds unusually fast, and the pitch of his voice is high and thin. In addition, the audience applause sounds accelerated and high-pitched, as well. It sounds like someone sped up the tape by 5 or 10 percent. This would speed up Don Pedro’s voice…and make it tinny and high-pitched. I noticed this in one recording after another: affecting both Don Pedro, and the audience. This is a different Don Pedro. His voice is deeper, more resonant and controlled. I had never heard him speak in this lower register…not in any of the other tapes. Yet this one sounded more natural, more consistent with the rhythms of human speech. This question assumes more significance, when you consider that the FBI had dominion and control over almost all the recorded speeches of Don Pedro. Possession of these recordings by anyone beside the FBI, was a violation of Public Law 53 (the Gag Law) and therefore a felony, punishable by ten years in jail. EXCEPT FOR THE VERY FIRST RECORDING, of the four that you just heard. So why don’t all the other recordings of Don Pedro, sound like the first one? My theory is that someone in the FBI made a mistake, and forgot to alter the first recording. Alternatively, someone managed to hide it from the FBI, and it now reaches us in an unadulterated fashion. If any of you have the proper sound equipment, please run these Don Pedro speeches at a slightly slower speed (5 or 10 percent) and see if they sound more natural. Perhaps someone at Latino Journal or Democracy Now! could try it…or a college student looking for an interesting senior thesis. For the moment, until proven otherwise, it is my belief that the FBI tampered with many of the recorded speeches of Pedro Albizu Campos. Given the viciousness with which they assassinated the man, and his reputation…I would not be surprised, if they even stooped to this. I’m TOTALLY BROKENHEARTED about this!!! Can’t believe that a country I loved so much(USA)would do something like this!!! My second time reading this magnificent book!!! I agree with your theory mr.Nelson Denis. To understand this you have to study what has happen to free fighters around the world. I would not doubt it at all!! They made this man suffer before actually crucifying him. This man stared evil in the eye and still did not buckle to the atrocity of a colonial oppressor. Puerto Rico may have a broken wing but one day it will heal and fly high towards the sky and sing again. It will break those chains its inevitable.